This is the second part of the domino. The set contains 32 cards, all editable. Enjoy! This is the first part of the Domino. The set contains 32 cards, all editable. Enjoy! This worksheet explains about the future with WILL. There are some exercises to practise. 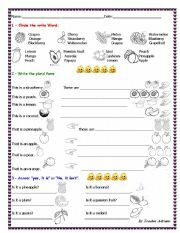 Using the fruits vocabulary students can practice the demonstrative pronouns with singular and plural nouns. 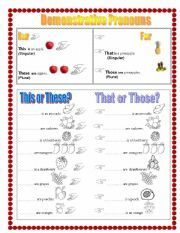 This is a simple test about fruits, demonstrative pronouns, plural and singular nouns, and short answers with verb to be. An exercise to practise with the students about actions that are happening at this moment. They look to the picture and write the sentence. 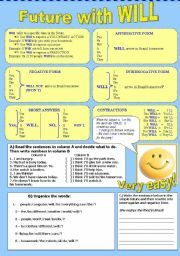 This activity is a review of the interrogative form of the verb to be. 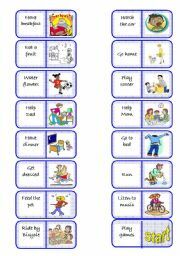 This presentantion explains the use of simple past, time expressions, regular verbs, affirmative, negative, interrogative and short answers. Ther are some exercises included. I hope it�s useful. 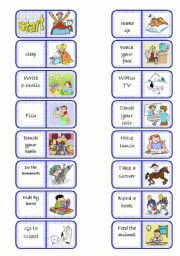 This ppt introduces Monica�s gang characters and it�s possible to explore the pronouns and verb to be. 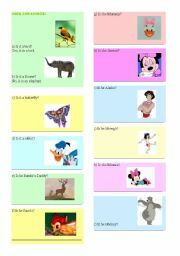 It�s a simple reading exercise about Shrek 1 movie. The students can do it after to watch the movie or before and then check their previsions.